As comics moved into the 1980s, with new distribution and new fanbases, DC comics began an extraordinary period of creativity. Their first order of business was to tidy up the sprawling continuity that had developed during the 1960s. 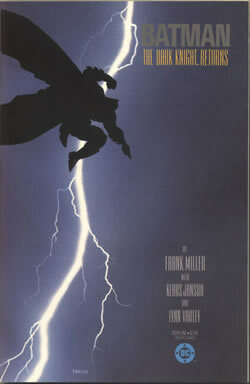 Then, following his extraordinarily successful run on Marvel's Daredevil, writer/artist Frank Miller was hired to create an end-of-days saga about the twilight years of Batman. The mainstream sat up and began to take notice. Following on the foundations laid by Miller's Dark Knight, Brit talents Dave Gibbons and Alan Moore offered their revisionist superhero series The Watchmen, which went on to become the best known comic outside of the fanbase. 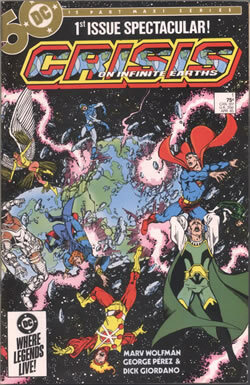 Crisis on Infinite Earths was named after the annual Crisis events in the Justice League comics, and aimed to rationalise the continuity glitches that had piled up in DC comics over the decades, and it was a cracking good read. The Dark Knight Returns showed one possible future in which Batman has become an embittered recluse and Superman had become a lackey of progressively dishonorable governments. It struck a chord and became hugely successful in mainstream bookshops. 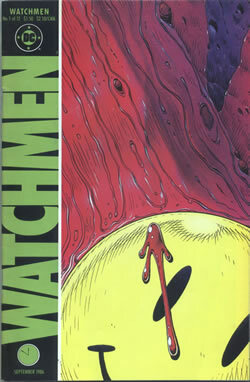 The Watchmen series was originally intended to star the Charlton heroes, which DC had acquired, but there was a change of heart and Moore was asked to revise the series to feature newly-created characters. But it's not hard to spot the Charlton originals beneath the thin veneer.